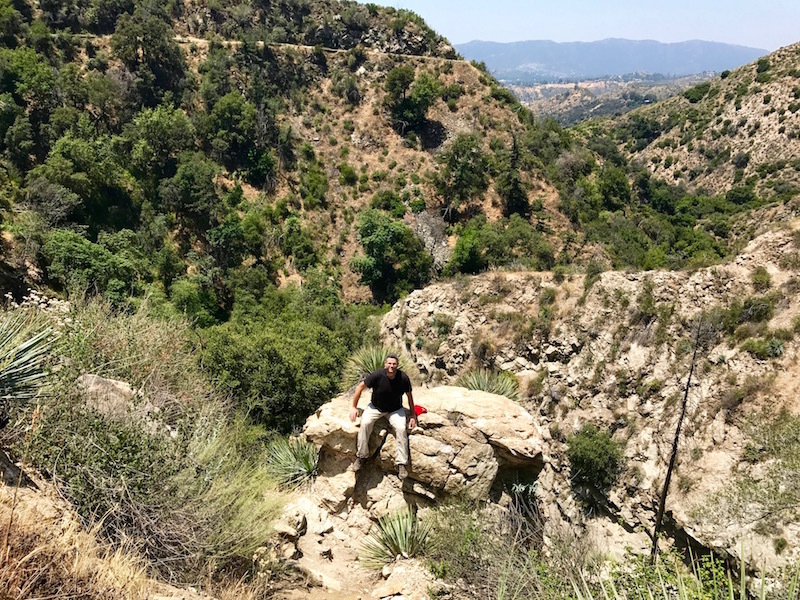 My Latest Epic and Historical Hike: To An Abandoned Gold Mine Near Los Angeles! | Keep It Up, David! 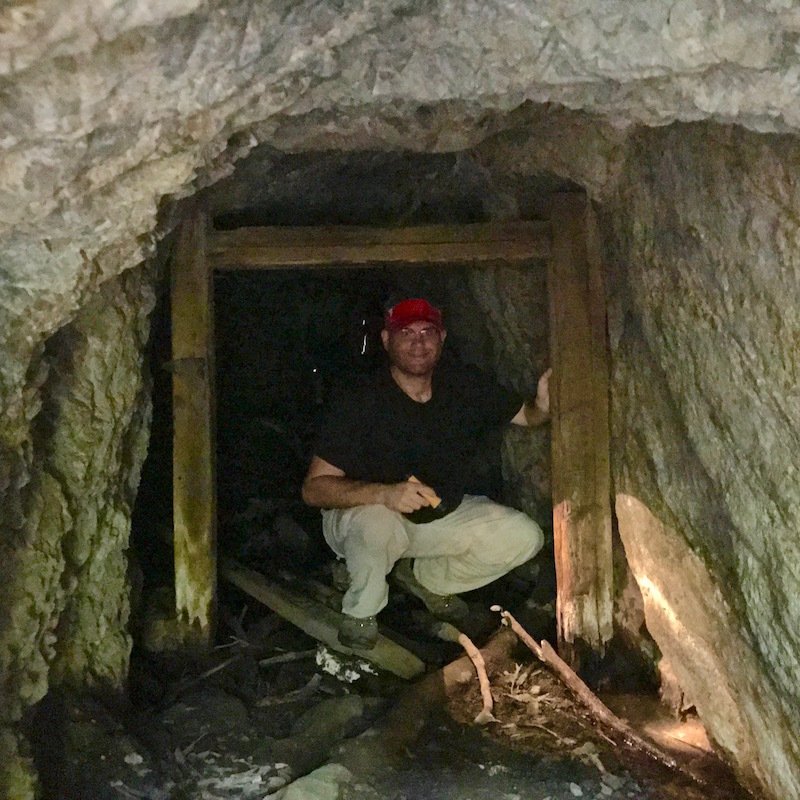 My Latest Epic and Historical Hike: To An Abandoned Gold Mine Near Los Angeles! There’s gold in them thar hills! Well, there used to be. And miners used this tunnel to dig it out of the San Gabriel Mountains. 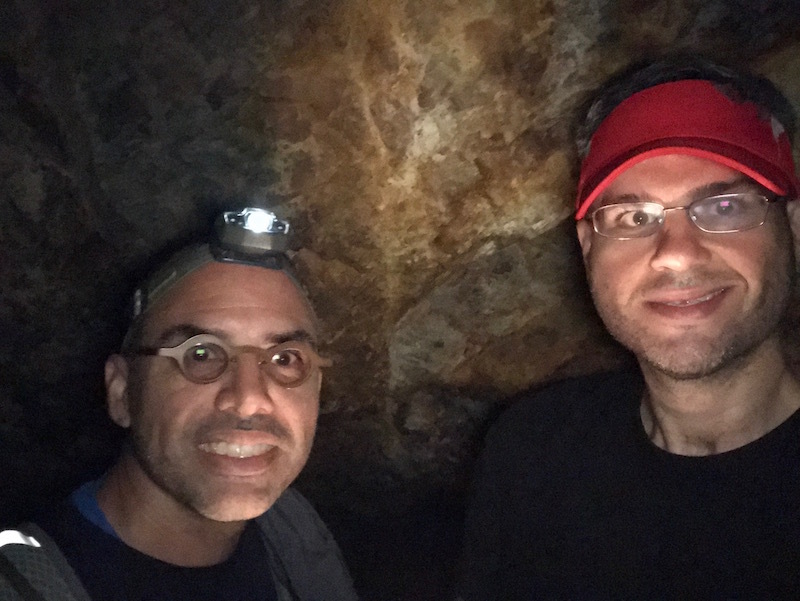 My long Memorial Day weekend began with a fantastic hike to this gold mine, known as the Dawn Mine, in the mountains north of Altadena, California. 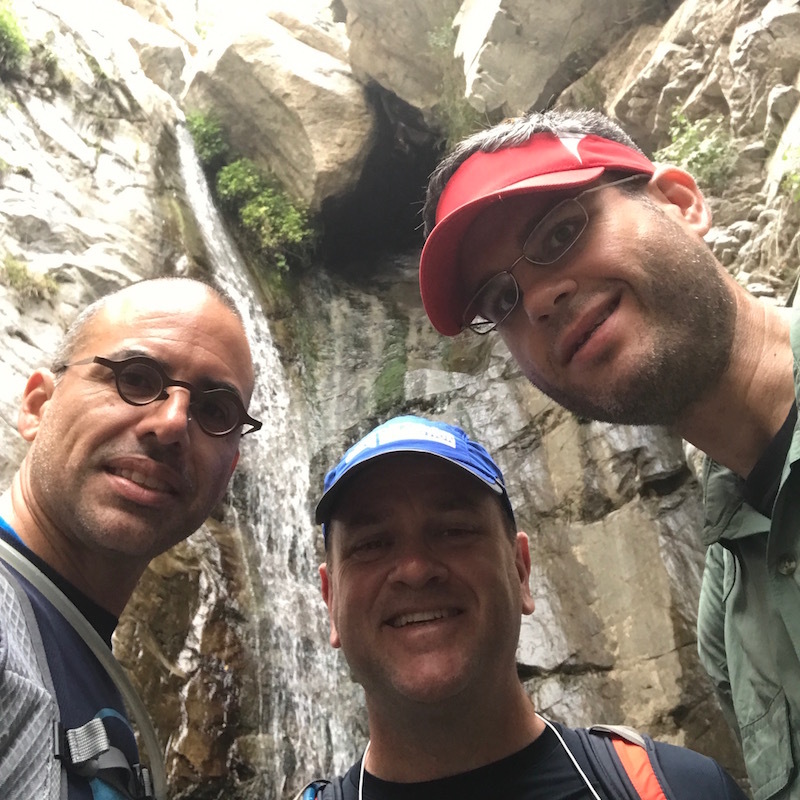 I went with two friends, Mark and Brian, and it ended up being a half-day adventure! 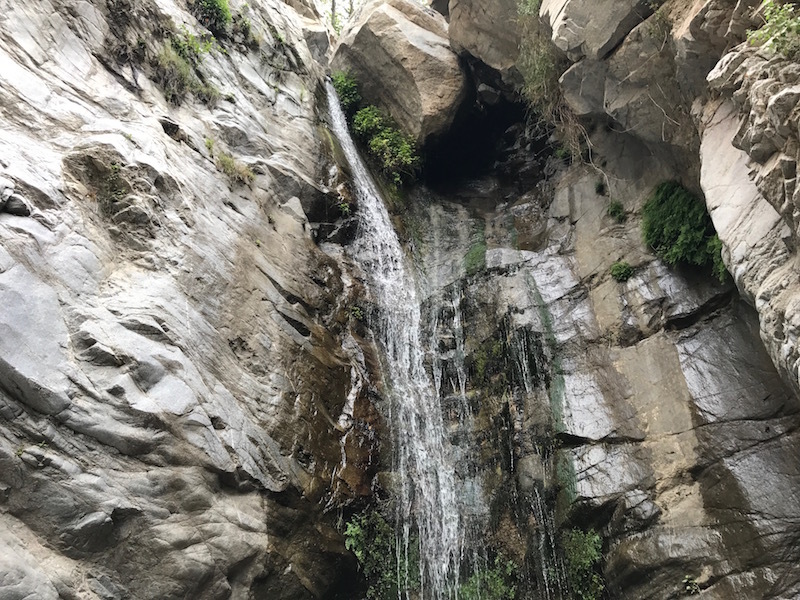 Our first stop was Millard Falls, a 50-foot waterfall, located about half-mile up a trail that starts at the Millard Campground, just up a dirt road from the parking lot. The trail criss-crosses back and forth across a trickling stream, and we followed the stream up until we saw it tumble out of the rocks above us. Just before we reached the parking lot, we turned onto Sunset Ridge Trail, which headed up the mountain to Mount Lowe Road. This was the way to Dawn Mine. Once we reached Mount Lowe Road (which is a fire road, no cars allowed), we followed it east for a little bit, then picked up Sunset Ridge Trail again, and followed it back down into a canyon. 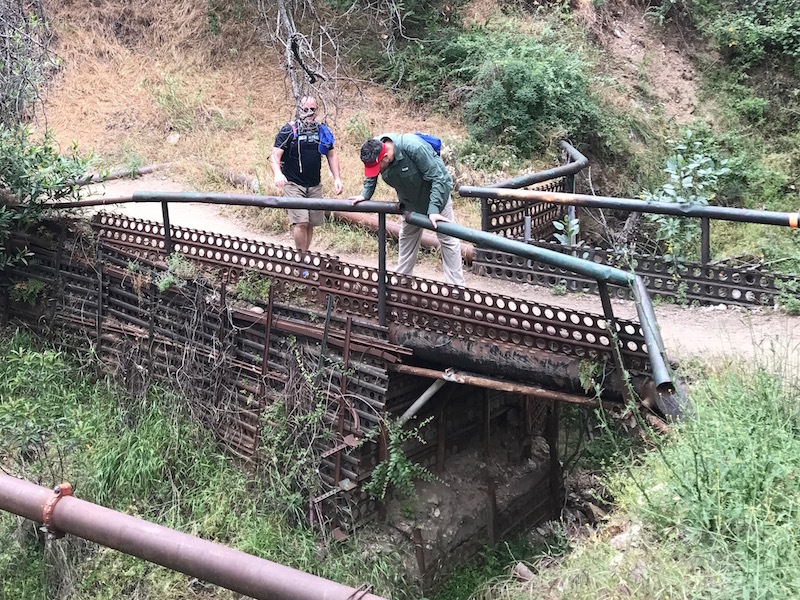 RELATED CONTENT: Other epic, historical hike posts include my visits to the Bridge to Nowhere, a Cold War-era military facility, a compound built by Nazi sympathizers, and to the remains of a century-old mountaintop hotel. This canyon is called Millard Canyon, and to our surprise, after a little while, we heard the very waterfall we visited earlier, and realized we were almost directly above it. Sure enough, the trail eventually led us back to the same stream that cascades through the falls, and we followed it upstream again, hopping back and forth across it, occasionally seeing the remnants of the road that was used, by mules, to carry ore down from the mine. A pretty place for a hike, huh? Once you break off from Mount Lowe Road, it’s about 2.5 miles to the mine. 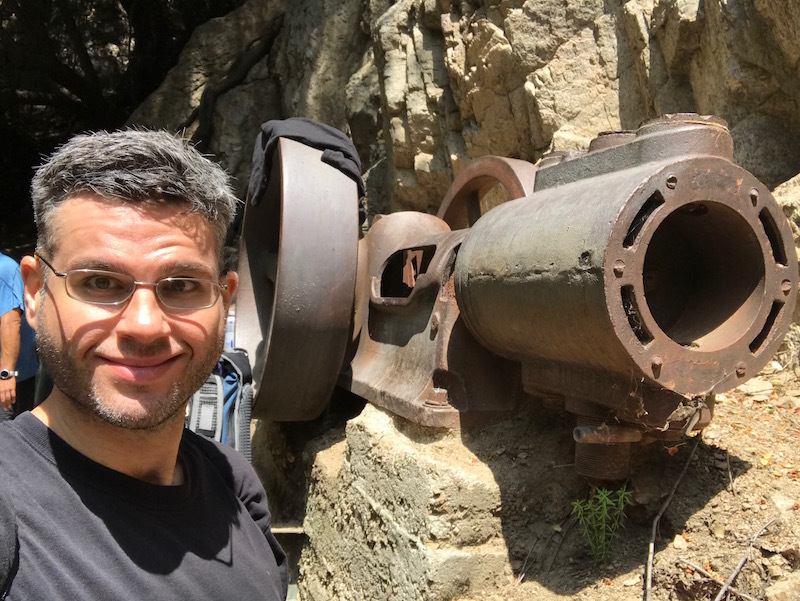 I had read to keep an eye out for an old, rusted piece of mining equipment on the hillside to the left, because the mine entrance was only a few feet away. 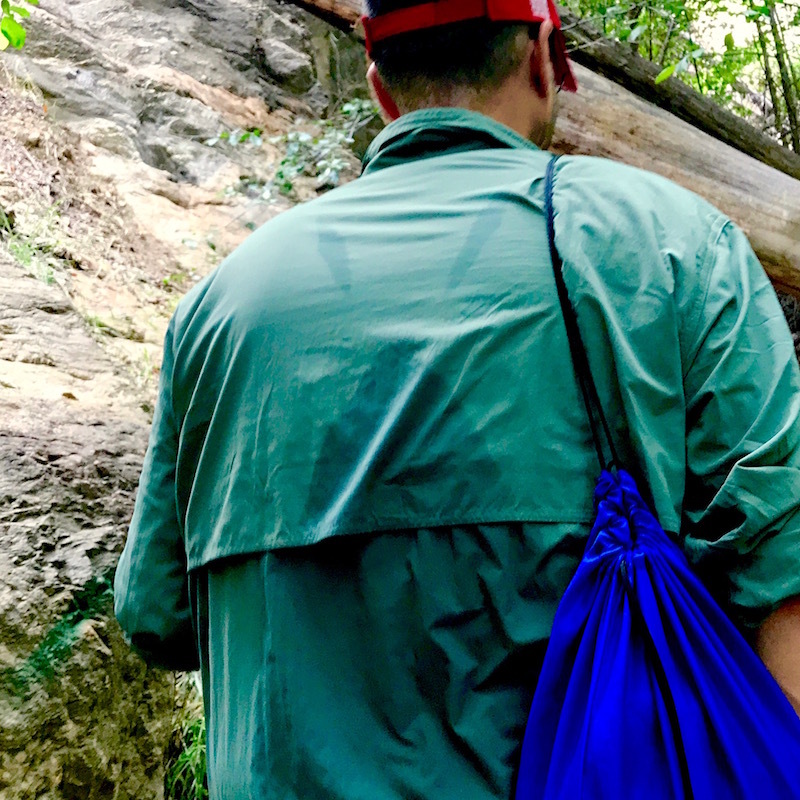 The equipment was easy to spot, because a group of about eight hikers had surrounded it with a giant lunch they had carried with them. 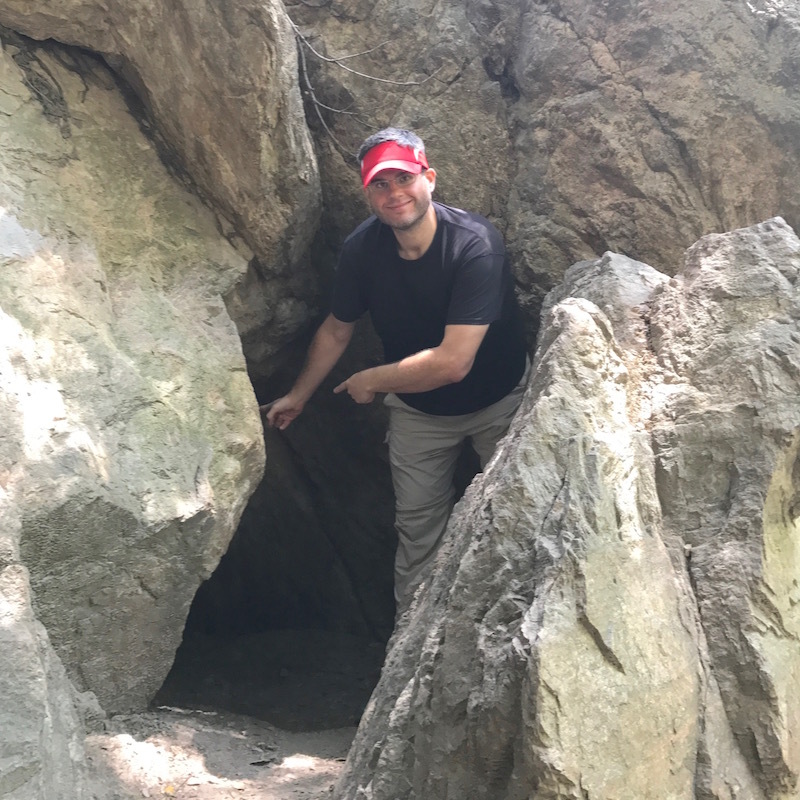 Sure enough, the entrance to the mine was indeed a few feet away – a short, squat cave tucked behind a boulder. The history of the mine dates back to 1895, when gold was first discovered in Millard Canyon. An early prospector named it the Dawn mine, after the daughter of one of his friends. The mine operated intermittently and changed hands a few times until the 1950s, when it was abandoned for good. It wasn’t a particularly fruitful mine, but it yielded enough gold to keep more than one mining operation hopeful that a big jackpot was right around the corner. 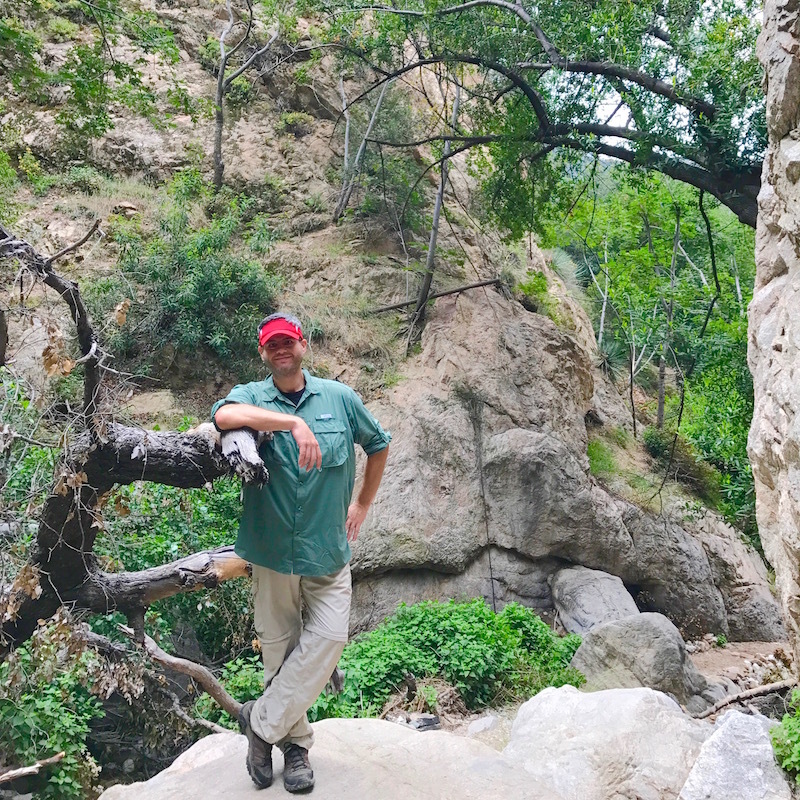 I didn’t hike all this way to not explore an old gold mine, and Mark felt the same way. So we got on our hands and knees, and ventured into that deep, dark cave. The first forty or so feet require being on all fours, and there’s a few inches of standing water. Previous visitors had dragged in logs, which you could walk along so you wouldn’t get so wet. After forty feet, the cave opens up into a much taller room, with a ceiling dozens of feet high. Mark and I had no trouble standing. Off to one side, there’s a pit, filled with water, that goes down a reported 80 feet. The tunnel continues to the left, and smaller tentacles extend from it. We ventured another 50 feet or so, until we reached a huge puddle, which could have been ankle or even shin-deep. We opted to not go further. 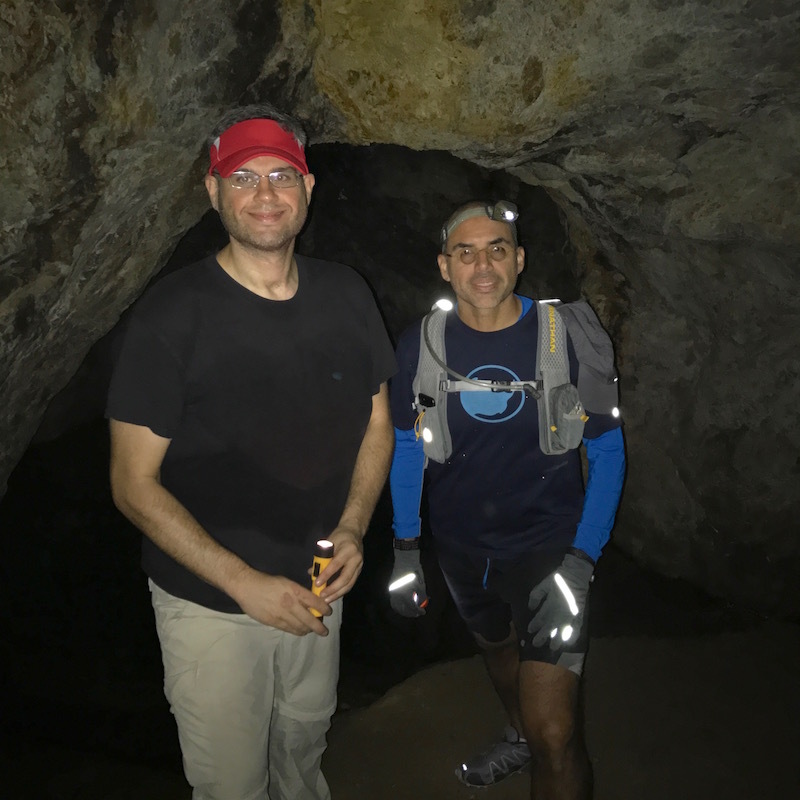 Yup, Mark had a head lamp, and yup, I was jealous! 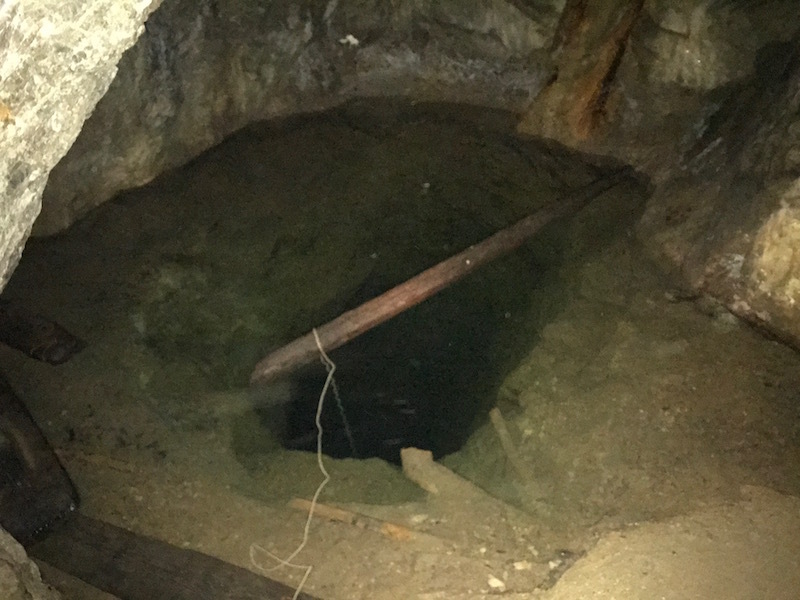 There’s apparently a second entrance to the mine, directly above the one we entered, but it involved climbing up some rocks that were too steep for our comfort level. With our explorations over, we relaxed outside the mine, ate some snacks and hydrated. We could’ve continued on the trail, and done a big loop (adding about a mile of additional distance), but we opted to head back down the trail we were on. At one point, I took off my sackpack to fetch my water, and Mark noticed my sweat stains made a spooky, screaming ghost face. Can you see it? The stats for this hike were impressive. Our hike lasted a little over 4.5 hours, and all told, between the mine and the waterfall, we covered 7.9 miles. (My GPS app said we did 7.4, but Mark’s Garmin said 7.9, so I went with his data.) We covered about 1,900 feet of elevation gain, and my app calculated that I burned over 1,400 calories. Whoa! This entry was posted on Wednesday, May 31st, 2017 at 12:57 am and is filed under Uncategorized. You can follow any responses to this entry through the RSS 2.0 feed. You can leave a response, or trackback from your own site. 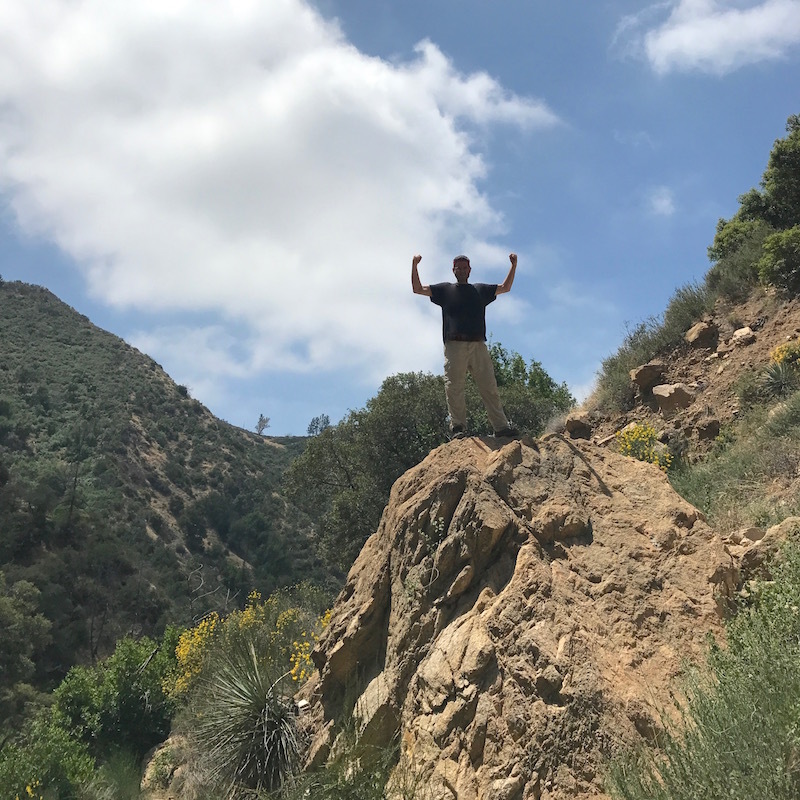 2 Responses to My Latest Epic and Historical Hike: To An Abandoned Gold Mine Near Los Angeles! Thanks! Glad you enjoyed so much!